A Softball Glove is one of the most important things to have when playing the field. With a deeper pocket than a baseball glove, it will help handle the bigger ball. The 4 Major Brands we sell are Rawlings, Worth, Easton, and Wilson. All of these brands are high-quality and come in different sizes and levels. 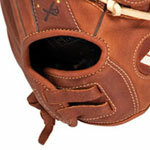 These softball gloves are made of leather material. These gloves are all well-made, high-end products. Some are even used by the top high-school and college athletes in the country. Many of the gloves we sell have an adjustable Wrist Strap. This gives you the ability to make the glove tighter or looser on her hand, helping with comfort level. Age is one of the most important factors in glove sizing, but is not the ONLY factor. Girls from the ages 4-11 will be using at most an 11 inch glove. Once girls reach the age of 12, we recommend a 12 inch glove because nationwide they are required to switch over to a 12 inch ball. If you have a daughter that is bigger, more advanced, and at your Club/Travel level, then the Worth Shutout Series is a good next step. The concept of Right Hand Throw and Left Hand Throw can be confusing, but is actually very simple. Sometimes people think, "She throws righty, so I need a lefty glove," but actually you choose the style that matches the hand she throws with. So if she throws right handed, order a "right hand throw" glove. It may seem a little complicated, so we've decided to make it real simple. We have split our gloves up into five categories: Beginner, Good, Better, Best and Professional level. Beginner and Good are gloves that are more youth oriented, and Better, Best and Professional are geared more toward adults. Just click the heading below for the category of glove that best fits your needs, or narrow your search even further by selecting the exact skill level and position you are looking for! -- When buying a glove for your beginning player, you want to make sure the glove is soft enough so she can close it with ease. At this level there aren't really set positions. Basically, if a player has a bigger hand, she will have to have a bigger glove. A soft, true to size glove is what you are looking for. At this level a lot of the gloves are pink, but don't worry -- if they are not happy with that color there are more colors to choose from. -- In a "Good" softball glove we move to the level where there will be positions, and if your daughter is playing first or catching it might be a good idea to get her one of those gloves. These gloves move away from the fake leather and go into a softer leather material. Again you are looking for a glove that will fit true to size and will be easy to break in. These gloves generally last about two years, or until she grows out of it. These gloves are great for your rec player but can also play travel. At this level the girls will still using the smaller softball, so a smaller glove is needed. -- The "Better" softball gloves are for kids that are getting pretty serious in softball and are on the borderline of moving out of the youth gloves and into a more serious glove. In these models you can even find a glove with a smaller hand opening. This means that they will have a tighter fit inside the glove. These are gloves you will get your money's worth out of and will generally last 3-4 years. More geared towards your travel player, these gloves also make sense for players moving to the bigger sized softball. -- The "Best" gloves are top notch gloves. These are geared more for the 7th to 9th-grade girl. It's a glove that will last a long time and will take some time to break in. When going with a glove like this, you want to make sure you are getting the correct size and something that she really likes because she will be using it for a while. This is the age where we move away from the youth model and into the adult models. More geared towards your Club Softball Player. -- There is no question these are the top of the line softball gloves here. These gloves are ones that will last a lifetime for sure, as long as the proper care is met. The best time to get these types of gloves are in December because they will take until April to break in and get soft. It is important to oil them up and care for them. I would NOT use a steamer because it will ruin the glove. These gloves are perfect for the high school or college player who is doing showcases and traveling to Florida, Georgia and South Carolina. These two positions are so important that they are arguably the most important positions on the field. Youth Catcher's Gloves are very hard to find, so here are some options that we have. Adult Catcher's Gloves are a bit more common and are available here. Youth First Base Mitts are really hard to find. My suggestion would be to look at baseball gloves. Adult First Base Mitts can be found here. Rawlings -- Rawlings has been around for a very long time. The great thing about them is that they offer an option for every level. Whether your daughter is between the ages of 4-11 and is a Recreational player, has moved up to become a Club/Travel player, or is a Serious High-School/College player, Rawlings has some really nice options. The leather is high quality regardless of the level you choose. Worth -- Worth is a division of Rawlings and comes into play for the Serious High-School/College player. Their gloves have nothing short of the highest quality available leather. Wilson -- Like Rawlings, Wilson has also been around for a quite a while. They also offer a glove for every level of player: Recreational players, Club/Travel players, and Serious High-School/College players. Wilson puts out a high quality product year after year. The Wilson product lines that people know the most are A2000 and A2K. Easton -- This is where my heart is. I am a little biased towards Easton because this is what I grew up using. They have a large variety to choose from for Recreational players, Club/Travel players, and Serious High-School/College players. All of the Easton gloves have what is called a VRS Palm Pad which is extra padding where the ball hits 90% of the time. Easton also includes Bio-DRI padding which helps absorb sweat. Breaking in a glove can be one of the hardest things for a young girl to overcome. It is possible that Dad might have to break in your first glove for you (sorry, Dad). The good news is that a lot of the gloves for younger girls come Game-Ready, meaning the leather will be soft enough that there will be hardly any break in period. As your daughter gets older there will be a time when they need to break a glove in themselves. I know that it sounds silly, but the best way to break in a glove is simply using it. It comes down to having a catch and just beating on it. When you are not using it, it is best to keep a softball inside it. If the glove is just not breaking in, the only trick I suggest is to pour a cup of lukewarm water over the glove. Check out this video of the Wilson glove guy breaking in a glove. Steam Treatment -- When you think about it, what is the worst possible thing for leather? It is steam and moisture. Oven -- Putting your glove in the oven will just dry out the glove.